Point Pleasant junior Jovone Johnson (11) and Josh Wamsley combine to bring down Herbert Hoover’s Ben Kee (3) during the second quarter of Friday night’s Week 4 football contest at OVB Field in Point Pleasant, W.Va.
One went well and one did not … and another was pushed back for another day. Point Pleasant won its sixth consecutive Homecoming game, Wahama dropped its fourth straight decision and Hannan had its game with Hundred moved to Saturday afternoon during Week 4 football action on Friday night in Mason County. The Big Blacks (4-0) rolled to their seventh consecutive regular season victory with a 53-21 triumph over visiting Herbert Hoover. PPHS led 19-0 after one quarter of play and were ahead 39-7 at halftime before wrapping up the 32-point outcome. The White Falcons (0-4) finally got on the scoreboard this season, but the Red and White ultimately dropped a 41-22 decision to visiting Belpre in a Tri-Valley Conference Hocking Division contest. The Wildcats (0-3) were scheduled to play the Hundred Hornets on Friday night, but had the game moved to a 2 p.m. kickoff on Saturday due to the four-plus hour drive. 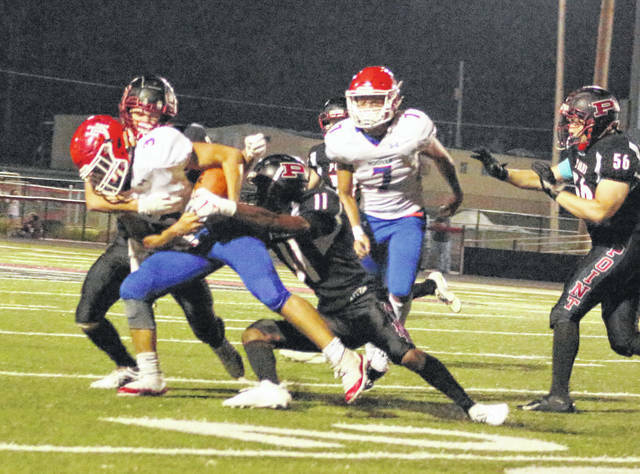 Both Point Pleasant and Hannan complete home stands next Friday as Van visits the Wildcats at 7 p.m., while the Big Blacks welcome Pikeville (KY) at 7:30 p.m.
Wahama continues TVC Hocking play on the road Friday when it travels to Stewart to face Federal Hocking in a battle of winless teams. Kickoff is scheduled for 7:30 p.m.
Due to an early deadline, the Mason County football games from Week 4 will be available — if information is received — in the Tuesday sports edition of the Point Pleasant Register. Game stories will be available online at mydailyregister.com before appearing in print.